A partial, horned dinosaur skeleton, initially thought to represent a young adult Triceratops has been reassessed following a month of preparation and cleaning and identified as a Torosaurus (T. latus). It was back in September that Everything Dinosaur first reported on the dinosaur fossil discovery in Thornton, Colorado (USA). Sadly, the highly respected Denver Museum of Nature and Science palaeontologist, Mike Getty was taken ill at the dig site and passed away shortly afterwards. Turns out, what was initially identified as a Triceratops has proved incorrect. As the Denver Museum of Nature and Science preparators have worked on the fossil bones, they have uncovered enough material to confidently ascribe the fossils to the closely related, but much rarer Torosaurus latus. An illustration of Torosaurus latus (Sergey Krasovskiy). Analysis of the large head shield that projects backwards from the skull has shown the frill of bone to be quite thin, with two distinct large holes (fenestrae), anatomical traits that are associated with Torosaurus and not Triceratops. The new diagnosis was made after a careful comparative study using Triceratops specimens already within the Museum’s vertebrate fossil collection. Torosaurus fossils are exceptionally scarce. There are several thousand Triceratops (T. horridus and T. prorsus) fossils, representing something like 2,000 individuals. In contrast, there are approximately 7 partial skulls of Torosaurus known. The yellow parts of the skeleton represent those elements of the Torosaurus found. Is Torosaurus Just a Very Old Triceratops? The lack of Torosaurus fossil material compared to other horned dinosaurs from North America, led to speculation that Torosaurus was not a valid genus, that the fossil material ascribed to Torosaurus actually represented very old, very mature examples of Triceratops. The Thornton specimen seems to represent a young adult animal, this may help to clarify the Torosaurus versus Triceratops debate. Parts of the skeleton are exposed (Torosaurus latus). The specimen has been nicknamed “Tiny”, but the work of preparing and studying these fossils is no small task. The material was unearthed at a Saunders Construction site for a new Public Safety Facility. Cleaning efforts have also revealed several more skull bones and a complete tibia (lower leg bone). 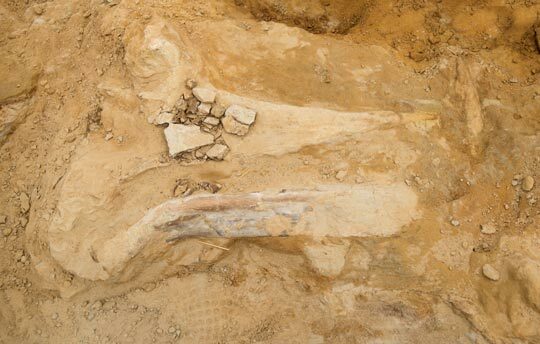 An estimated 95 percent of the skull and at least 20 percent of the skeleton have now been identified, making this the most complete Cretaceous-aged fossil discovered in Colorado. Visitors to the Museum can observe the fossil preparation process in the Fossil Prep Laboratory, cleaning and preparing is estimated to take several more months. 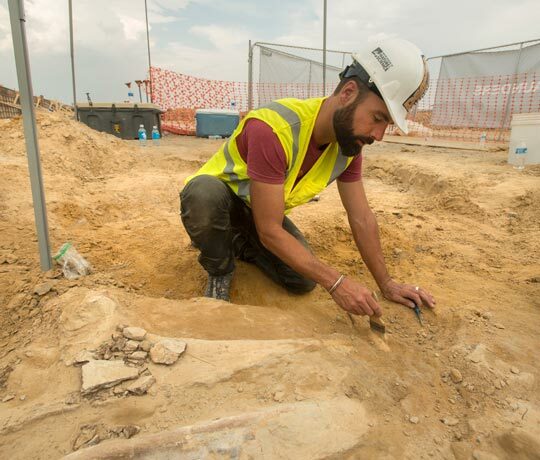 Joe Sertich, curator of dinosaurs, (Denver Museum of Nature and Science) at the dig site (Thornton, Colorado). We wonder what Mike Getty would have made of it all? Everything Dinosaur acknowledges the assistance of the press team at the Denver Museum of Nature and Science in the compilation of this article.